This isn’t an official obituary, just my personal recollections on the passing of a very great writer. Robert O’Neill stands with Louis Alexander as one of the major innovators in our profession. Both were also story-weavers. Robert introduced extensive reading into the Kernel Lessons series, with The Man Who Escaped. He was later the Series Editor of Longman Structural Readers, as well as an author, before they were subsumed into Penguin Readers. Where do I start? I’m looking at the bookshelves in my office, where I think and hope I have a complete set of Robert’s work. Periodically the shelves fill, and some ELT books get shifted to the book storeroom upstairs, but none of Robert’s work ever makes that journey. When I began teaching in Bournemouth, Robert O’Neill was already a local legend at Eurocentre, just around the corner from Anglo-Continental where I worked. He was known as the author of English in Situations (OUP 1970) which I consider an essential tool to this day. Robert perfected the art of finding a brief, interesting situation which crystallized a structural point. For years I kept a copy with me because if a student came up with a problem you could use a situation with leading questions which made it clear. Then you had an invention exercise where students created their own explanatory situations. 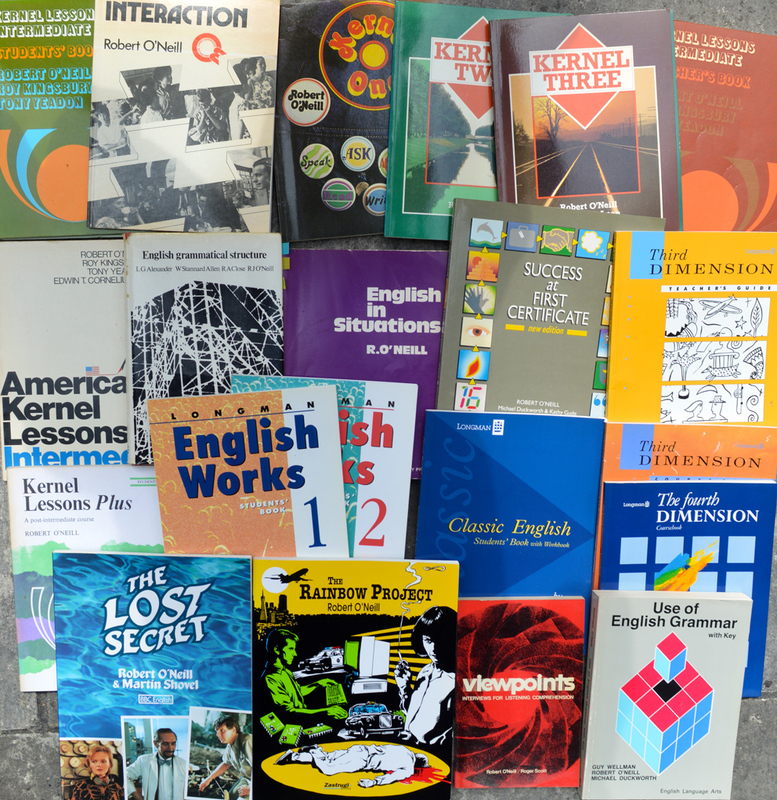 Kernel Lessons Intermediate (with Roy Kingsbury & Tony Yeadon) was the textbook I considered the benchmark of excellence when I started writing. I didn’t know Robert then, but Bernie Hartley arrived at Anglo-Continental and he had worked with Robert closely on teacher-training at Eurocentre, and on the analysis of the micro-skills of the classroom teacher. Both Robert and Bernie could spend 90 minutes on something like eye contact, and be funny and riveting at the same time. Robert taught the early RSA Cert. TEFL courses in Bournemouth. 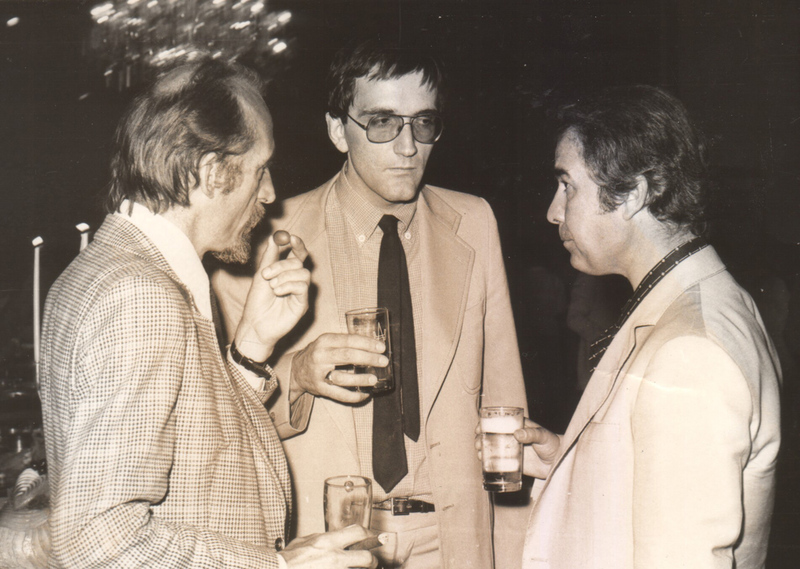 Robert was also a collaborator on English Grammatical Structure with Louis Alexander, R.A. Close, and W. Stannard-Allen (Longman 1975) which was the clearest analysis of a progression through English grammar from simple to complex, with each stage adding just one new element. Bernie Hartley called it “the textbook author’s bible.” Robert’s wonderful essay in the ELTJ on structural and functional approaches was “My Guinea Pig Died With Its Legs Crossed” pointing out that knowledge of structural elements enable us to understand unpredictable and probably unique sentences, and I quoted him for years. When we were deciding on publishers, Bernie went to see Robert to ask for advice, and he told us in no uncertain terms to go with OUP. Robert moved from Bournemouth to Brighton, and he came along to our very first Streamline English talk in Brighton. The talk before us was on a new Oxford dictionary, and Robert gleefully pointed out a long list of “circular definitions”, the sort of thing where “close” is defined as “shut” and “shut” is defined as “close.” He ripped it apart, something he was inclined to do from the audience when he disapproved. Just ask Stephen Krashen. We had to go on next and I was terrified, but he smiled and nodded enthusiastically throughout our talk, then made a little speech to the audience at the end saying he thought the book excellent. As his own Kernel One was in direct competition, this was extremely generous. I got to know Robert as a friend on our various travels. I still recall a 1979 conference in Athens, where Robert, Brian Abbs and I spent happy hours arguing the ins and outs of textbook writing. Then in Japan around 1980, Robert was touring with Longman, and I was with OUP. We both got dropped off by the Japanese local staff at about 7 pm every night, and spent the evenings putting the world to rights. In Osaka, a hurricane meant the cancellation of both of our talks. We spent the afternoon in the hotel coffee shop, which in 1980 only had sweet Japanese rosé wine. Robert insisted on buying both the straw-covered display litres of Chianti … they were most reluctant to sell them … and we polished them off. I’ve rarely enjoyed wine more. A tour with Robert was not only entertaining, but would make me feel guilty. I would do the same well-honed talk with the same carefully-placed jokes and anecdotes on teaching with video every day of a tour, but Robert would do a completely different talk on Success at First Certificate every single day, using different examples from the book. Every one of them got the audience talking. We both got delayed at Warsaw a few years later and we spent the afternoon in the airport restaurant. Robert could switch languages at the drop of the hat. Conversation was a dizzying tour of quotes in various tongues. He could imitate any accent in English perfectly too, as well as code-switching at speed. He used to describe himself as an Irish-Jewish-American who lived in Britain. When he wasn’t in Germany, Poland, Turkey, Spain, Cuba, Uruguay or Japan. Having been with Robert with American teachers and British teachers, he could code switch at will between Chicago-accented American (his home town) and RP British. His background, like so many of our profession, was acting and drama. He may not have had early formal qualifications, but he was capable of arguing any point of linguistics or applied linguistics with anyone. I never managed to find a topic from Gregorian chant to the political philosophy of Rousseau (to name two I know we discussed at random) that Robert didn’t know about. I used to play a CD with the slow section of Ravel’s Piano Concerto in G before my talks. I never mentioned the title of the piece or the pianist. The first time Robert was there, he said “I’m glad you played the Bernstein version. Easily the best.” He was of course correct. He was in the true sense, a Renaissance man. Robert was also a natural psychologist, and would ask soul-searching questions after around ten minutes of starting a conversation, and due to his charisma, you would find yourself compelled to answer. In many ways, Robert felt he was treated poorly in later years by the publishers he made so much money for, and whose credibility in ELT he had helped establish. I know from our conversations that he couldn’t get a publisher for some of his later ELT work, which is astonishing and the publishers’ loss. He was difficult to work with for commercial publishers, because of his integrity. If he got 90% through a book and felt it wasn’t right, he’d simply start again. I last saw him three years ago in Brighton, where he came to my talk on reading. He was completing his Ph.D on Holocaust Studies, and we spoke about it. He was in vibrant form, shocking the more faint-hearted in the audience (as ever) with some typically robust and piercingly accurate comments on the current state of ELT. What EFL needs today is writers capable of developing skills that writers in other genres regard as essential: they must be able to develop the kinds of story, plot and character that can keep groups of very different learners interested in the language. The texts and conversations they write must exemplify as naturally as possible how people speak and write outside the classroom. However, the texts and dialogues must also serve a distinct pedagogic purpose. Amen. That was Robert. I shall miss him. Robert O’Neill was undoubtedly the most charismatic writer with whom I ever had the privilege of working; I was his desk editor at Longman as they published Kernel Lessons Intermediate (KLI). He was also to become a friend, and even agreed for a time to lend the use of his name as Company Secretary to BEBC. In his public life, Robert was often outrageous, but only to stimulate a response from his audience, whether it was an individual or a group of teachers. His extraneous comments and references to bodily parts or their functions are legendary. In many ways he shared a love of language and life with the likes of Dylan Thomas and you couldn’t help being drawn to him. He always thought outside the box, long before the expression (or the box) had entered common parlance and especially when dealing with established “authority”. He described working on KLI as “a glorious battle” and this was working with his publisher who, to mix metaphors, spent a lot of time trying to force Robert inside a box of their making. At a time when publishers are now seeking to re-brand authors as mere “content providers” it is particularly sad and ironically fitting that the ELT world has lost its most colourful and creative contributor, the like of whom we shall never see again. Peter, I appreciate your swift and delightful memories of Robert. Thanks, he was a great mentor to me in different ways. Thank you, Peter, for sharing this – a great tribute to a brilliant man. What a wonderful piece, Peter. How very fitting for such a remarkable man. If you’ll excuse my phrasing: you brought him to life for those of us who never knew him. Thanks for giving me a chance to know Robert through your remembrances. Had dinner last night with some ex-Eurocentres friends and we toasted Robert. I never knew him, but knew of him, and he certainly inspired my writing. In fact, I would say he has been the biggest single influence in my work. Thank you for writing such an evocative piece – it has brought him to life for those of us who never met him. Thank you, Peter, for that moving tribute. For teachers and EFL writers of a certain age, Robert and Kernel Lessons Intermediate were hugely important . I didn’t know him personally, but I attended a panel discussion on textbook writing he took part in at a JALT conference in the late 80s. At the end, a member of the audience asked, “I want to write textbooks. Could you give me some advice?” After a very long pause, Robert leaned forward, glared at the unfortunate individual and spat out, “If you want to write, then f*cking write!” Good advice, really. I think that was the last question of the afternoon. Like Peter, I knew Robert for many years and he was a great friend dating back to Bournemouth days. He was as you say a natural psychologist. He loved to walk, eat, drink and argue. We have lost a great man. Thank you Peter for a wonderful piece on Robert. I worked with him for almost 24 years at ELC in Brighton where he maintained an office and was a very powerful presence! I just wanted to say that if any of Robert’s old friends and colleagues would like attend Robert’s funeral , it is on the 12th August at 16.00 at the Woodvale Crematorium in Brighton, All welcome. Great man. Showed me that the way to enjoy teaching is to let the students enjoy learning. I still love English in Situatiions, and…shh…, I still use Kernel Intermediate. Well, why not? Thank you very much for this unofficial biography Peter. Good to hear more of Robert’s exploits in such an evincing way. He will remain a legend. Robert met someone from OUP (I think it was OUP) on the plane on the way back from Miami in March 2013 where he had spent a month walking and thinking, recovering from surgery. She asked him if he was Robert O’Neill. He replied that he was indeed that man. She said ‘ You are a legend.’ He didn’t know the expression – he came home and said…’She said I was a legend!! !’ It gave him such energy at the time – he was so driven by this remark. I would love to know who that person was. Never has the expression been used so accurately. A legend indeed and a great loss to our profession. Thank you so much for writing up these memories, Peter. I based my entire teaching (and later text book writing) career on Robert’s work. A true genius. Many thanks for this rich tribute to Robert. I knew him in his Bournemouth days, and though my own career took a very different turn, Robert and I remained friends at a distance. He came to visit me in Cambridge a few years back. We hadn’t seen each other for quite a long time. He was a joy to be with, in all the ways you have described. When we parted, he touched my cheek affectionately. It is impossible to describe the tenderness of that moment. Rest in Peace, old friend. I’d like to echo the other comments, Peter, and thank you for an excellent piece that vividly evokes the great man. I often used to meet him in the corridors at the English Language Centre and to the routine, “How are you, Robert?” he would reply “Well, still here — I think!” When it comes to his enduring influence on teaching, learning and ELT writing – he continues to be. what a loss, yes he was a legend. Dear Robert, I was saddened but not surprised to hear of your death. I read all the personal accounts and that brought back the hours (and hours and hours) we spent together before I returned to Japan semi-permanently in the mid-1980s. After writing AN OUTLINE OF AMERICAN LITERATURE for Longman, I wandered off into journalism and a stream of works on Japanese culture during the war years. Perhaps you’ve come across one or two of them? Knowing you, you probably have…did. You appeared in my life at a low point and directly or indirectly led me on to its high point. For a year or two we were best friends. After that geography and slowly diverging careers separated us until that sudden appearance at our door in Sapporo. You dandled our son Christopher on your knee and made amazing prognostications which (unfortunately) have largely come true. Then, as such things often happen in life, we lost contact. We still love you (Ayako and I) and now we know you are dead. My world is smaller now that I know. But you are still in my heart…our hearts. …………Who knows? Maybe we’ll be meeting someday soon. The universe keeps expanding. Who knows?